If you’re new to mindfulness meditation, then it might all be a bit overwhelming in the beginning trying to make sense of it all and getting it to work in your head. Things such as what do you focus on, should you stay still or move, is it best to sit or lay down, am I doing it right? 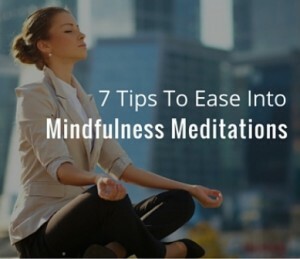 To help make it easier for you to get started so that your mindfulness meditation sessions flow more naturally, there are some simple things you can do to take the pressure off having to remember to many details. I like to think that the best way to approach any type of meditation is to have a beginner’s mindset. It’s so easy to think that we know it all, or have mastered something, when the truth is that meditation, like many things in life, is completely organic in nature and is best approached with no expectations. Having expectations of what your experience of meditation is going to be like is like trying to control the wind – it’s never going to work. This does not mean that we don’t have amazing experiences from meditation; it just means that sometimes they will be ordinary, and other times we may even judge that it didn’t work. The point is that we should only meditate because we want to, not for any other reason. When we put pressure on ourselves to ‘get’ something from our meditation be it to quiet our mind, reduce stress, or anything at all, then it sets us up for success or failure based on what happens. Meditation can and does create miracles in our lives and has a huge range of long-term health and well-being benefits, but they will arise naturally as we develop a consistent meditation routine. Most people seem to start experiencing these benefits after about 6 weeks of regular practice. To keep it simple for now though, a fundamental principle of meditation is to allow whatever happens to be okay. Just like a flower blossoms from the roots being nourished, so too does meditation blossom inside us by accepting everything that happens without judging or reacting. By accepting everything we think, feel or experience while meditating, we move a step closer towards becoming more present in the moment and that is the foundation of right mindfulness. There were quite a few tips shared in the video, which made the most sense to you? My tip on having fun with meditation? Begin with 5-minute sessions? Or, start with just 5-minutes a day? If you are serious about learning mindful meditation for tranquility and insight, that video should really help you work out how to do that. Feel free to share this and leave a comment on what your biggest takeaway was.